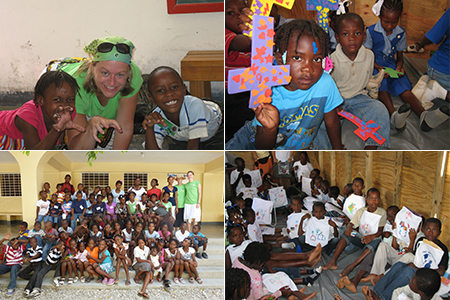 Since 2003, FHM has sent annual VBS teams to Haiti. Team members spend 6 weeks before the trip preparing materials, Bible lessons, games and crafts, and learning Kreyol. While in the Blanchard community of Port-au-Prince, the team typically has about 175 students who are divided into 4 groups. Each group visits a different theme area each day for 2½ hours. The groups are led by two or three US VBS team members with two Haitian translators and four or more Haitian class assistants. In the mountain community of Fondwa, about three hours outside of Port-au-Prince, US team members conduct a three-hour session for 40 to 50 students, and then enjoy some rest and relaxation in the lovely setting. Vacation Bible School supplies cost about $3000 each year. This includes snacks for the children, crafts, games, a Vacation Bible School tshirt, and parting gifts such as tote bags and water bottles. Contact Nancy Holton if you are interested in providing supplies for our next Vacation Bible School. Sign up for a team.